Montclair, New Jersey: The annual 'Welcome to Walnut Street' event will take place this Saturday, May 2nd from 10:00am to 3:00pm on Walnut Street in Montclair, from Forest Street to the Walnut Street Train Station. There will be food trucks, local handcrafts, activities for kids, live music, food, and local vendors. In addition, the event will coincide with the YMCA of Montclair's Healthy Kids Day, which will take place on Walnut Street this year. There will be parachute games, face painting, a clown, yoga, fitness, and other activities. In case of rain, the events will be postponed to Sunday, May 3rd. Sponsors include the merchants of Walnut Street, Vanriper Creative, the YMCA of Montclair, and the Montclair Township Parking Utility. South Orange, New Jersey: The South Orange Symphony will present a spring concert on Saturday, May 9th at 7:30pm. The event will take place in the Sterling Hall auditorium of South Orange Middle School, and is free and open to the public. The concert will conclude the 66th season of the South Orange Symphony, and will be conducted by Susan Haig, who is also the creative director and founder NJ Arts News. South Orange Middle School is located at 70 North Ridgewood Road. To learn more, call (973) 376-6349. Montclair, New Jersey: The Van Vleck House and Gardens will host the 12th Annual Plant and Garden sale, which will feature perennials, shurbs, trees, tomatoes, and climbers. The event will take place on Friday, May 1st from 11:00am to 4:00pm, Saturday, May 2nd from 9:00am to 4:00pm, Sunday, May 3rd from 11:00am to 4:00pm, and everyday from Monday, May 4th to Thursday, May 7th from 11:00am to 3:00pm. A sold-out garden party and kickoff luncheon will take place this Thursday. The sale will take place rain or shine at the Van Vleck Gardens, which are located at 21 Van Vleck Street. Sponsors include PNC, Whole Foods Market, Garden Cottage, and the Bobbi Brown Studio. Friends of the Van Vleck House and Gardens will receive a 10% discount on all items. Admission to the sale is free. North Caldwell, New Jersey: The North Caldwell Public Schools will present a student art show and concert on Tuesday, June 2nd. The event will take place at the Gould School, and will feature the artwork of students between 6:15pm and 7:15pm, followed by a concert between 7:30pm and 8:30pm. Parents can purchase the framed student works for $25.00 each. The Gould School is located at 132 Gould Avenue at the corner of Mountain Avenue. This photo was taken at Riverfront Park along the Passaic River in Newark. Verona, New Jersey: The Township of Verona will sponsor a family hike this Saturday, May 2nd from 11:00am to 1:00pm. Participants will meet at the Verona Community Center, and then hike the trails of the Essex County Hilltop Reservation as a group. Attendees should bring a bottle of water and a snack. The rain date is Sunday, May 3rd. The Verona Community Center is located at 880 Bloomfield Avenue. Click here to register using Verona Community Pass. Newark, New Jersey: Together North Jersey, also known as the North Jersey Sustainable Communities Consortium will present "Leading the Way: From Plan to Implementation" on Tuesday, May 5th from 8:30am to 4:30pm. The event will take place at the Paul Robeson Campus Center at Rutgers University's Newark campus. The organization, which is a project of the Edward J. Bloustein School at Rutgers University and the New Jersey Transportation Planning Authority, will celebrate the accomplishments of the Local Demonstration Project, Local Government Capacity Grant and Non-Governmental Organization Micro-grant Programs during the event. According to Together North Jersey, the programs "together include nearly 40 local planning projects designed to make our region more competitive, livable, efficient and resilient in the years and decades to come". Local leaders and developers are expected to attend this conference, which will feature "a variety of peer-learning, networking and 'match-making' opportunities to connect funders, developers, state agency program managers with local projects and others interested in supporting placemaking, economic growth and investment in the region". The Paul Robeson Campus Center is located in the University Heights section of the city at 350 Dr. Martin Luther King, Jr. Boulevard. Millburn Township, New Jersey: Greenwood Gardens, a 28-acre garden in the Short Hills section of the township, will offer free admission on Friday, May 8th, in honor of National Public Gardens Day. The gardens opened to the general public during the spring of 2013, and were once part of a private estate. The gardens will be open from 10:00am to 4:00pm, and reservations are not required. Admission to the gardens normally costs $10 for adults. Greenwood Gardens is located adjacent to South Mountain Reservation and Old Short Hills Park at 274 Old Short Hills Road, between South Orange Avenue and Downtown Millburn. This photo was taken along Market Street in Newark's Ironbound. Planes preparing to land at Newark Liberty International Airport pass directly over the neighborhood. This photo shows the National Newark Building and Eleven 80 in Downtown Newark. Bloomfield, New Jersey: The annual Taste of Bloomfield event will take place tomorrow, Sunday, April 26th, at the Oakeside Bloomfield Cultural Center. Participating restaurants will include Amalia’s, Anthony’s Cafe, Anthony’s Cheesecake, Applegate Farm, Blue-J Syrup, Brookdale ShopRite, Buco Ristorante, Casserole Bistro, El Matador Mexican Deli & Restaurant, Fin Raw Bar & Kitchen, Fitzgerald’s 1928, Frungillo Caterers, Jersey Artisan Distilling, Kona Ice of East Essex, Mr. Cupcakes, Orange Squirrel, Salute Bistro, Senorita’s, Spice Thai Cuisine, Village Gourmet Deli & Caterer, Yellow Plum, and Zi Zia Pizzeria & Trattoria. Tickets will cost $25 in advance and $30 at the door. Tickets can be purchased online, or at Hot Bagels Abroad (1129 Broad Street) or Anthony's Cheesecake (71 Washington Street). Click here to purchase tickets online. Participating businesses will serve a variety of foods to attendees at no additional charge, though there will be a cash bar. The Oakeside Bloomfield Cultural Center is located at 240 Belleville Avenue. Nutley, New Jersey: The Township of Nutley will open a community garden in the near future. The new Nutley Community Garden will be located in a former parking lot near the Nutley AmVets post at the corner of Walnut Street and Park Avenue. The garden is a partnership between the Nutley Health Department, Greenutley, and the Nutley AmVets. The garden will have one row where produce will be grown for the Nutley Food Pantry of the American Red Cross and the Vincent Methodist Care Kitchen. Plots will be available to Nutley residents and organizations on a first come first serve basis. To obtain a plot, or to learn more, call the Nutley Health Department at (973) 284-4976. The garden will be funded by the Partners for Health Foundation. This photo was taken at the Military Park Station of the Newark Light Rail. Newark, New Jersey: The 'Books on the Move!' literary tour of the New Jersey Performing Arts Center will stop at two local libraries in Essex County. At both locations, Alvin Ailey by Andrea Davis Pinkney will be read. The book discusses the story of the founder of the Alvin Ailey American Dance Theater. The first reading will take place on Saturday, April 25th at 2:00pm at the East Orange Public Library, located at 21 South Arlington Avenue near Route 280. The reader will be Carol Jenkins. The second reading will take place on Saturday, May 2nd at 2:00pm at the Springfield Branch of the Newark Public Library, located at 50 Hayes Street between 14th and 15th Avenues. The reader will be Valencia Yearwood. Admission to both readings is free, and the first 25 children will receive a free copy of Alvin Ailey. Orange, New Jersey: The Orange Public Library will host a 130th Anniversary celebration on Thursday, April 30th from 6:00pm to 10:00pm. During the event, the Community Culture and Technology Center will be unveiled. In addition, there will be live music, guided library tours, and a cocktail social with hors d'oeuvres. Attendees should dress in business attire. The Orange Public Library is located at 348 Main Street in the Stickler Memorial Building, which was constructed in 1900. To learn more, call the library director at (973) 673-0153. This photo shows the Jackson Street Bridge, which connects Newark with Harrison, Hudson County. Newark, New Jersey: An Earth Day recycling event took place in the Ironbound District of Newark today. Residents dropped off old and broken electronics at Peter Francisco Park near Newark Penn Station. The event was presented by the Ironbound Business Improvement District, Covanta, Panasonic, the City of Newark, and Unrban Renewal Corporation. Newark, New Jersey: Hundreds of politicians, government workers, and residents came to the Brendan Byrne Plaza at the Essex County Government Complex this afternoon as a bronze plaque was dedicated in honor of the late Raymond Durkin, an Essex County native who became the chairman of the New Jersey State Democratic Party. Durkin, who grew up in Newark's West Ward and later lived in Maplewood, passed away in December, 2014. The new plaque is located along a promenade outside of the Veterans Courthouse and Essex County Hall of Records. Above: County Executive Joseph DiVincenzo, Jr.
East Orange, New Jersey: A free shredding event will take place in the City of East Orange on Saturday, May 2nd, from 9:00am to 1:00pm. Residents can bring personal and professional documents to be shredded during the Spring 'Clean Up Green Up' Day at 44 City Hall Plaza near the East Orange Train Station. Documents can include tax returns, deeds, bank statements, and duplicate checks. Shredding will be provided by Safe Shredding, and the event will be presented by New Jersey Clean Communities and the City of East Orange. To learn more, call the Clean and Green Environmental Center of East Orange at (973) 666-2262. Newark, New Jersey: A conference regarding sustainability will be held in Newark's Central Ward next month. Essex County College will host the Third Annual Sustainable Living Empowerment Conference on Saturday, May 16th from 10:00am to 6:00pm. The event is free and open to the public. It will be presented by Newark Science and Sustainability, and the host will be Dr. S. Aisha Steplight Johnson of Essex County College. There will be presentations, demonstrations, exhibits, and discussions by a variety of presenters, including City of Newark Planning Director Damon Rich, designer Chris Sanders, health policy advisor Karen Blumenfeld, and Chef Tiffany Derry of Bravo Television's 'Top Chef'. To learn more, call (646) 399-0337. Essex County College is located at 303 University Avenue in Newark. Newark, New Jersey: One of New Jersey's largest and oldest Holocaust Remembrance programs will take place this week. The Newark Holocaust Remembrance is scheduled for this Thursday, April 23rd from 11:00am to 12:00pm. The event will take place at the Berger Organization's Best Western Plus Robert Treat Hotel, located at 50 Park Place near the New Jersey Performing Arts Center. According to the city, "the observance focuses not only on memorializing those who were victims of the Holocaust, but emphasizes the importance of remembering the past for the sake of the future". According to the Berger Organization, the keynote speaker will be Robert Max, a veteran of World War II. The event will be attended by Newark students, and the Arts High School choir will perform. A Holocaust Remembrance service took place in Maplewood on Sunday. Survivor Marsha Kreuzman and community religious leaders spoke to attendees. This photo shows the Bonnell Building on Market Street in Newark. Short Hills, New Jersey: East Orange's mayor, Lester E. Taylor III, will hold a forum this evening at the city-owned East Orange Golf Course in Short Hills. The forum, which will take place between 6:00pm and 8:00pm, will discuss plans to renovate and reopen the golf course, which had been temporarily closed. According to a statement issued by the city, the forum will "put an end" to rumors regarding "whether (the city was) going to sell the golf course". The statement added that the golf course will reopen on Saturday, May 23, and a that a new clubhouse, restaurant, and driving range will open in 2016. “Transforming the East Orange Golf Course into the asset it was intended to be has been one of my administration’s top priorities,” said Mayor Taylor in the statement. The golf course is located on property which is part of the East Orange Water Commission's reserve. The address is 440 Parsonage Hill Road, between JFK Parkway and Passaic Avenue. Bus transportation to the forum will be provided to residents. Buses will leave from 44 City Hall Plaza in East Orange starting at 5:00pm. Seating is limited. The forum is open to all. Note: This press release was submitted to PlaceNJ.com. Send yours to placenjwebsites@gmail.com. Sean Bankhead, Hip Hop dancer and instructor at Dance 411 Studios in Atlanta, as well as guest instructor at Broadway Dance Center, NYC, will be teaching Master Classes and offering insight and feedback to aspiring dancers at the Fourth Annual Orange Dance Festival, to be held on Sunday, April 26th at the Lincoln Avenue School in Orange, New Jersey. Mr. Bankhead has been inspiring dancers since 2006 when he first started sharing his talents for dance and choreography via YouTube, and has since expanded his repertoire to include working with artists such as Beyoncé Knowles, Britney Spears, Diddy, Miley Cyrus, Tiffany Evans, Drake, Young Jeezy and choreographers Fatima Robinson and Jamal Sims, among others. He has also performed at the Grammy Awards, The Soul Train Awards, American Idol, MTV, BET, BET Awards and the Apollo. Mr. Bankhead has persevered through many struggles to pursue his dream, and encourages young dancers to be prepared to do the same – to use their passion and their commitment to the art of dance to achieve their goals. Deborah Rembert, Coordinator of the Orange Dance Festival and Director of the Orange Dance Conservatory, understands these struggles all too well. “Arts Programs in our communities are under fire with budget cuts and funding considerations, but we are striving to work beyond those challenges and present our young people, and the young people of our neighboring communities, with opportunities to explore the art of dance. We are fortunate that the Arts Programs in the Orange Public Schools are alive and well, due to the tireless support of our Superintendent, Mr. Ronald C. Lee.” Ms. Rembert continues, “The Orange Dance Festival offers lovers of dance age 5 through adults with a chance to take a full day of classes in a variety of dance styles, and meet and learn from some of the top Master Dance Educators in the field. Along with Mr. Bankhead, we will also feature Master Classes with former Dance Theatre of Harlem Company Member, Ms. Karen “KB” Brown and Ms. Ebony Williams, a member of the Cedar Lake Contemporary Ballet Company and performer in Beyoncé’s “Single Ladies” video. There will be opportunities to hear from students and Professors from College Dance Programs at the University of the Arts, Pace and Marymount; as well as opportunities to take part in mock auditions and to participate in a performance showcase at the end of the day. And all in a safe, nurturing environment here at the Lincoln Avenue School in Orange, NJ for an affordable cost -- $35 for a full day of dance, and lunch is included! Honestly though, the world of dance is such a close knit community, and that is why we can think of no better way to kick off National Dance Week than by inviting dancers from all of our communities to come and learn and dance and have fun with some of the best educators from the larger dance community.” The Orange Dance Festival will be held at the Lincoln Avenue School at 216 Lincoln Avenue, Orange, NJ on Sunday, April 26th from 9:00-3:00, with a performance showcase to follow. Cost is $35 per student, and if you register 3 dancers together, your 4th dancer will attend for free. The festival is open to all dance studios, dance schools, youth programs, public and private school dance programs and any lover of dance in our communities. Pre-registration is available at the Park Avenue School, 231 Park Avenue, Orange, NJ or via email at remberde@orange.k12.nj.us. Please indicate in the email if your dancers are interested in performing in the showcase so Ms. Rembert may provide you with specifications. The Orange Dance Festival is presented by the Orange Dance Conservatory and sponsored by the Orange Public School District under the guidance of Superintendent of Schools, Ronald C. Lee. This photo shows the former Paramount Theater in Downtown Newark. Maplewood, New Jersey: The first 'Maker Madness' will take place at Columbia High School in Maplewood on Saturday, May 2nd from 10:00am to 4:00pm. There will be a variety of activities for children ages five through fourteen. Activities will include robotics demonstrations, building with Legos, woodworking, 3D printing, drawing from nature, ArtBot, wearable computing, origami, and book art. Activities will be centered around STEAM, which stands for science, technology, engineering, art, and math. Admission and all activities are free. Parents are asked to accompany their children to this event. Volunteers are needed, and those interested in volunteering can register here. Station sponsors are also welcome. Click here to learn more. Columbia High School is located at 17 Parker Avenue between Valley and Academy Streets. 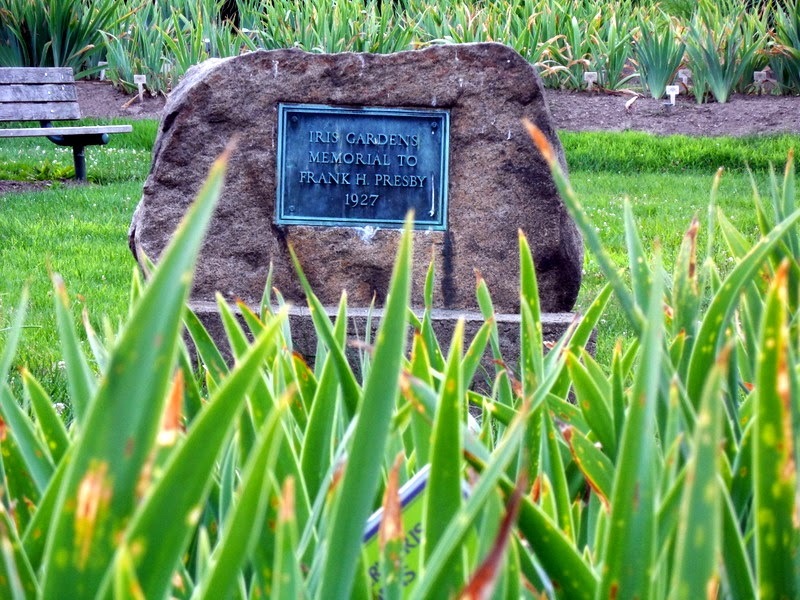 Upper Montclair, New Jersey: A family garden party will take place at the Presby Memorial Iris Gardens in Upper Montclair on Saturday, May 16th. Activities will take place between 11:00am and 3:00pm. There will be an exhibit of student art on display, entertainment, and the Bloom Room will be open for shopping. Other activities will include face painting and crafts. The Essex County Environmental Center and the Essex County Master Gardeners will have booths, and several food trucks will attend. In case of rain, the event will be held on Sunday, May 17th. The Presby Memorial Iris Gardens are located at 474 Upper Mountain Avenue, near the Mountain Avenue Station of the Montclair-Boonton New Jersey Transit rail line. To learn more, call (973) 783-5974.